I’ve mentioned the piece a couple of times on here over the last few months, but wanted to wait for a performance/recording to explain it a little more. So here we are at last: Network no.1 for string quartet. The score is a hybrid of graphic and traditional, with a graph network diagram functioning as a map, and traditionally notated reference. Each ‘node’ on the map relates to an element from the separately notated gamut of sonorities. The edges of the map signify a potential route from one musical element to another. The length of an edge determines the duration of the element to be performed. So in this sense the map represents the time-space and structure of the piece, while the reference contains the sonic material. As previously mentioned, the work exists in a a state of non-linearity. Performers work independently, following their own paths across score ‘maps’. 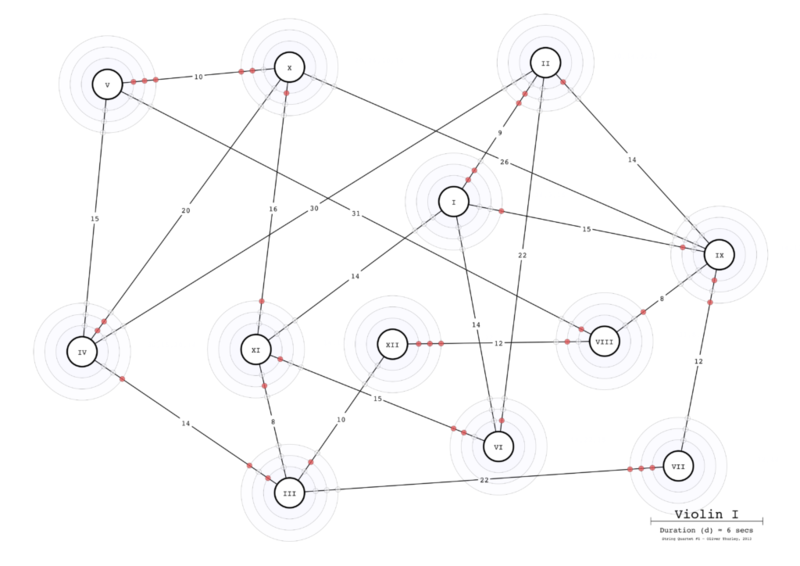 Routes are determined stochastically (and regenerated each time the network graphs are compiles), although each player may choose their own starting point. Thanks also to Tony @Big_Pause for his patient advice during the programming stage.